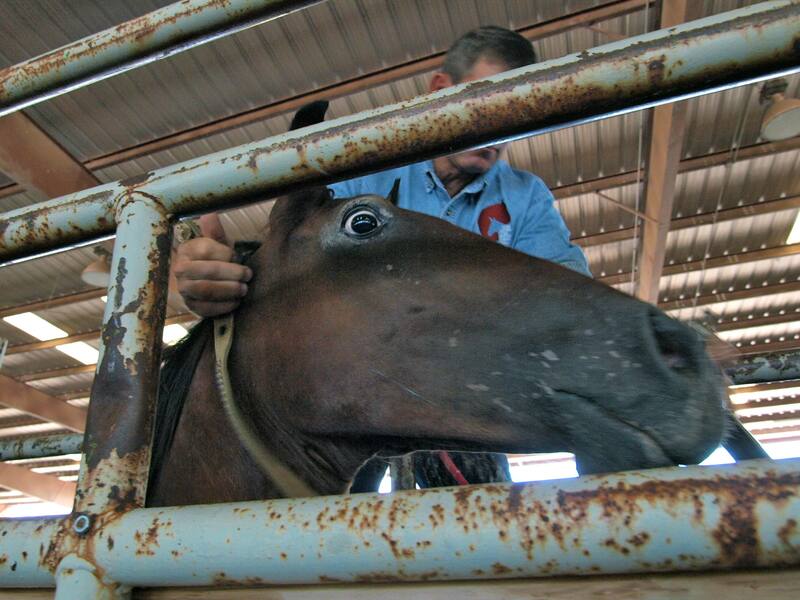 One fine summer day in New Mexico, I did something especially dangerous: I went to a wild horse and burro auction in Bernalillo. I managed not to bid on any of them, but I fell in love many times over. Nothing is more beautiful than a wild mustang and these were going for a song. When I lived on rangeland in New Mexico, my neighbors and I had own intractable problems with feral horses and I have a lot of mixed feelings about how to balance what’s best for horses with what’s best for the land. Too many horses wreak havoc on grasslands and everybody from horses to hares to coyotes quickly starts to suffer. 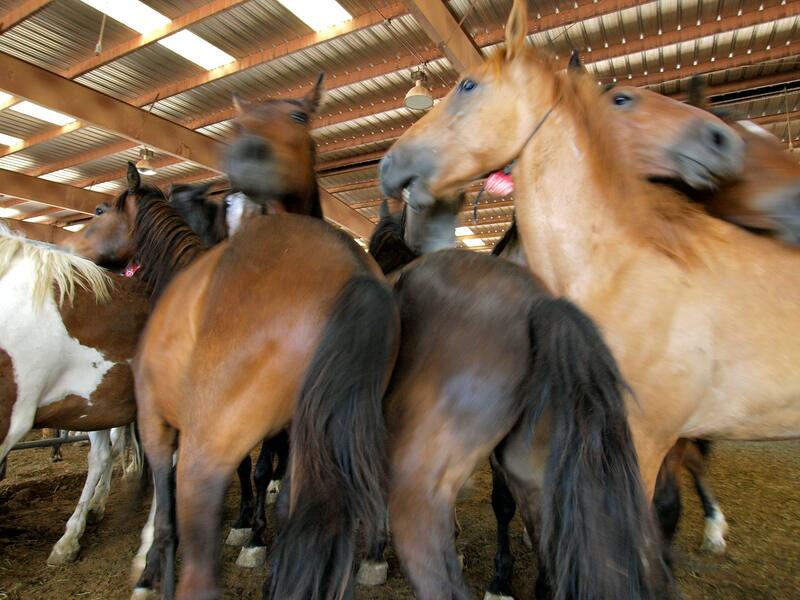 There are no easy answers to the problem of what to do with too many horses, but when I heard of this chance to see first hand one of the Bureau of Land Management’s solutions – wild horse adoptions – I immediately decided to go. Mustangs have long been a symbol of the freedom of the West, but these days there is less and less free space for them on the range. Horses grazing on Bureau of Land Management land, which includes 264 million acres of public lands in the West, must compete with cattle for grass and with coal, natural gas and oil extraction operations and wind farms for space. Wild horses are quickly losing ground. Mustang critics are quick to point out that wild horses are not native to North America, at least not anymore: the last truly wild horses died out around 10,000 years ago, likely due to climate change at the end of the last Ice Age and possibly compounded by overhunting by newly arriving humans. But North America must also be acknowledged as the original home of the horse: Equus evolved here and thrived here for more than 57 million years, spreading across the Bering land bridge to Asia and beyond. The horse was reintroduced to North America by Spanish Explorers in the early 1500’s and escaped animals gradually began repopulating the continent. Native Americans began catching, raising and riding horses in the 1600’s, starting in the Southwest and spreading east into the Plains. Over the next 300 years, freed horses belonging to traders, explorers, settlers, pioneers and ranchers added to the wild herds. Wild horses have a long and rich history here and in 1971, Congress passed the Wild Free-Roaming Horses and Burros Act in an effort to protect “the living symbols of the historic and pioneer spirit of the West”. 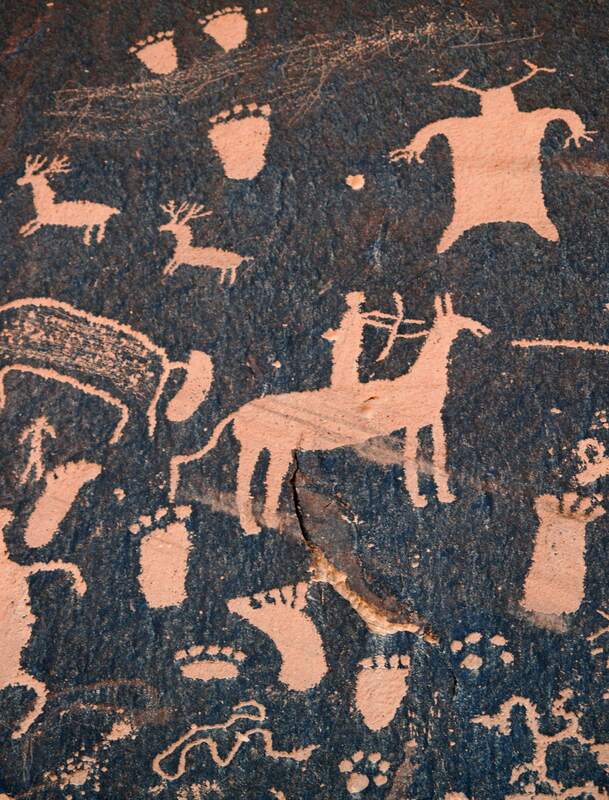 The new laws made it illegal to poison or shoot a wild horse or burro and ensured that the animals would be allowed to remain on the land, in “manageable” numbers. Defining “managable numbers” is where things get tricky. With few natural predators – only mountain lions and wolves hunt horses – mustang populations are constantly on the increase. Today, roughly 66,000 wild horses roam the West, more than half of those in Nevada and the rest mainly in Montana, Oregon, Utah and Wyoming. The Bureau of Land Management, the agency charged by Congress with managing mustangs, claims rangelands can only support around 26,000 horses. So what to do with the 40,000 surplus animals? The BLM’s primary solution is to round them up and offer them for adoption. Adopting a wild mustang is easy: all you need is a 20 X 20 foot enclosure with a minimum 6-foot high metal or wooden fence, a record clean of animal abuse or neglect convictions and between $25 and $125 for the adoption fee. The hard part comes when you bring your very own mustang home. Animals offered for adoption are usually only a few months off the range and have not been handled except for basic veterinary care including vaccinations and geldings. These are truly wild creatures and it may take months of daily work to tame them for handling and years to train them for riding. Every case is different and some trainers are more gifted than others, but in general, turning a wild horse into a trusty steed is a long, difficult and dangerous road. 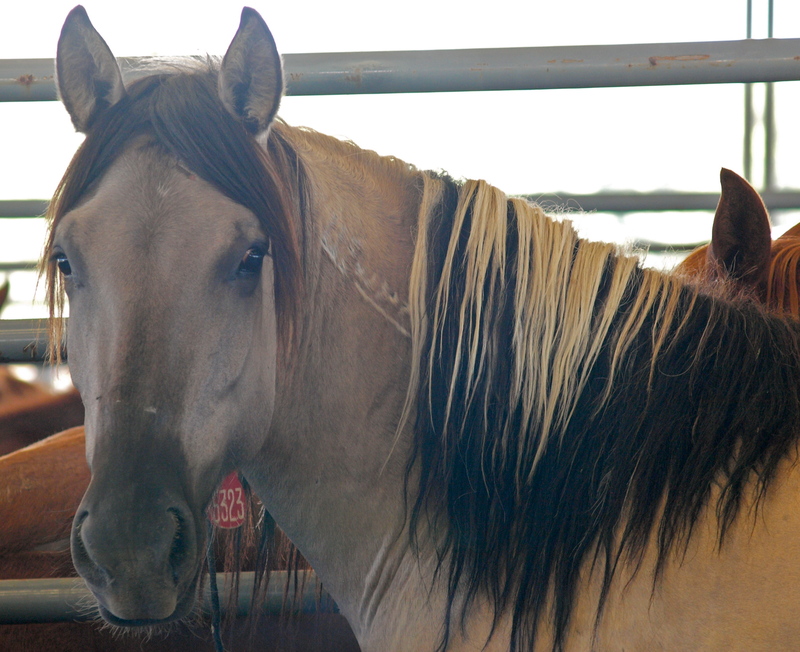 The wild horse auction today in Albuquerque gave interested buyers the chance to bid on the choicest horses in a herd of about 50 yearlings, mares and geldings. The animals were separated into five pens: two pens of yearlings, one of mares, one of geldings and one of burros. The yearlings were the calmest. Most had been rounded up with their mothers the winter before and weaned over the summer. Having spent so little time on the range, they were the most used to corraled life. The mares and geldings were a different story. 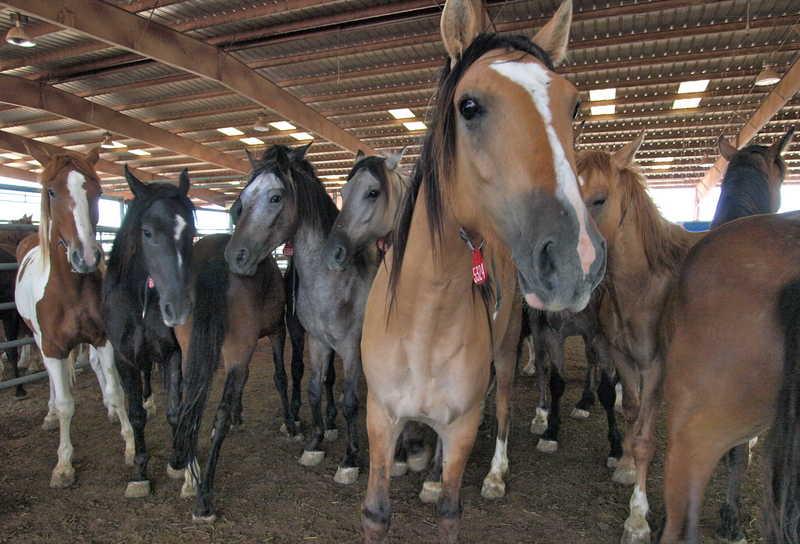 The majority of the adult horses were between two and four years of age and the BLM manager warned most were on “the wilder side of wild”. Both pens were given to panicking; one horse would spook, setting off the others in a swirling, stomping mass of frantic manes, tails and hooves. The BLM officials gave the crowd about an hour to check out the horses in the corrals before starting the bidding. 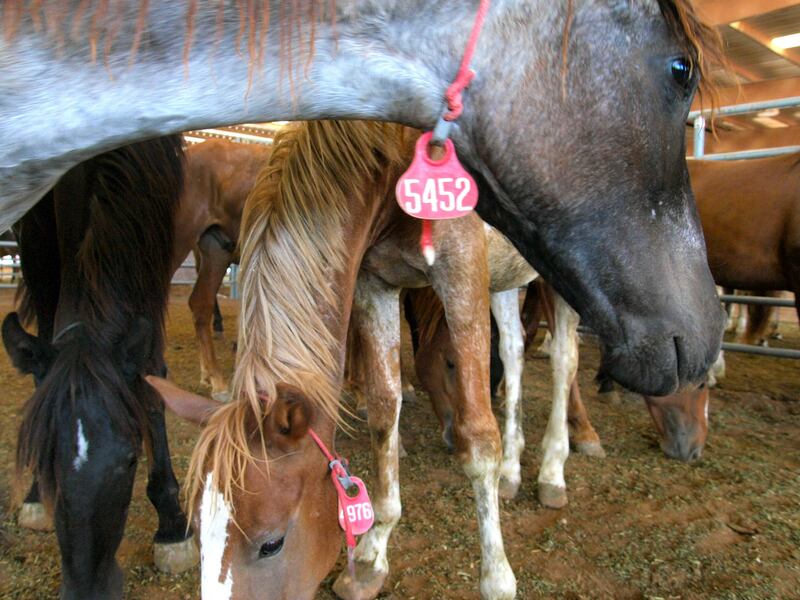 At each pen, interested buyers would call out the number of the animal they wanted – numbered tags were secured on a rope around each horse’s neck – and the bidding would start at $125. There were few battles; most animals went for the base price or five to ten dollars more. A few animals were marked down to the bargain basement price of $25. 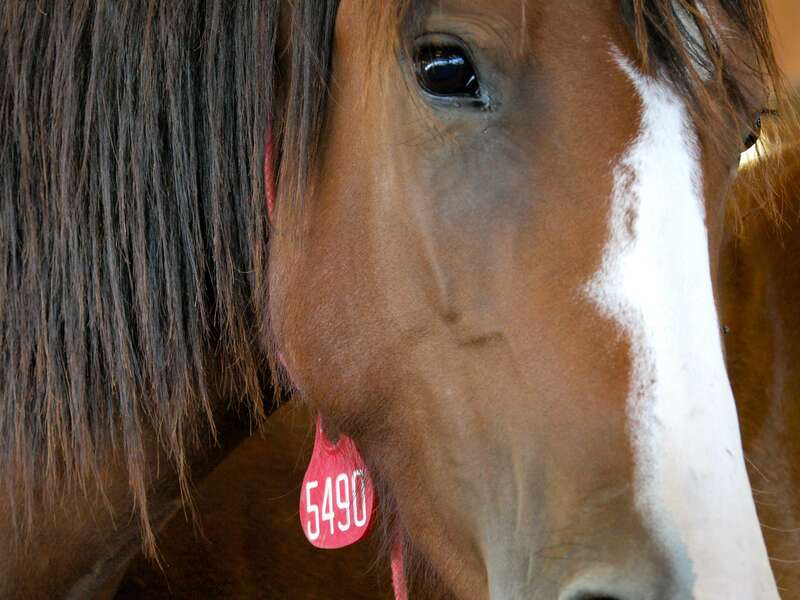 The auctioneer explained that after a horse has been to three auctions without being adopted they slash the price in hopes of finding them a home. 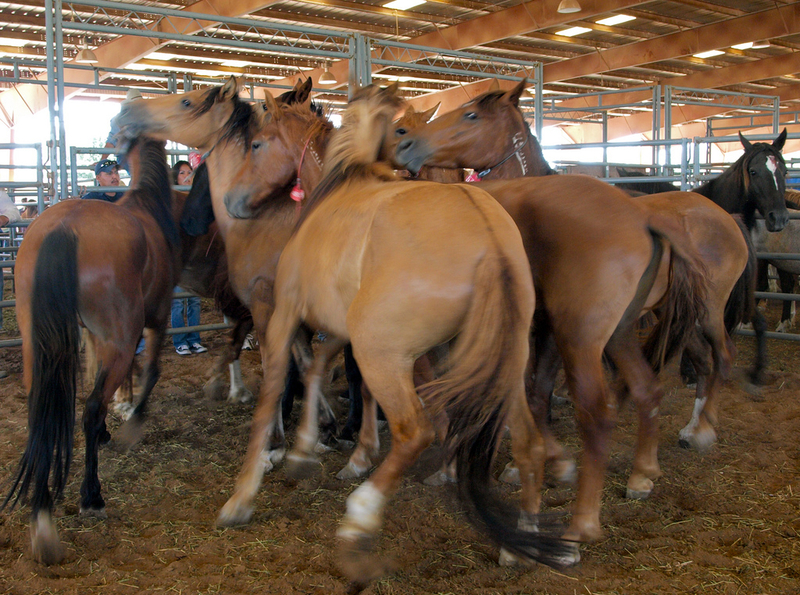 Today five horses – all bays– and three donkeys were offered at the bargain price. One of the horses and all of the donkeys were adopted. 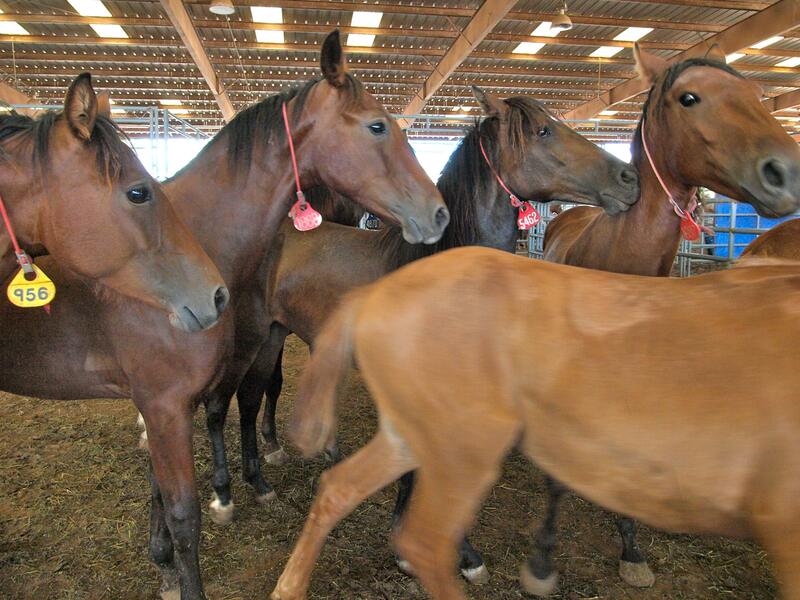 Unadopted horses are kept indefinitely at holding facilities in Oregon, Oklahoma and Kansas. Contrary to some reports, the BLM does not currently euthanize healthy animals and does not send horses to slaughter, though both tactics have been used in the past. Wild Burros, All Adopted Today! The other major monetary incentive offered by the BLM is a $500 bonus to anybody adopting an animal four years or older. Older animals are the wildest. Some can never be gentled for handling, let alone riding, making for an expensive (upkeep runs around $1,000 a year, minimum) and possibly dangerous pet. 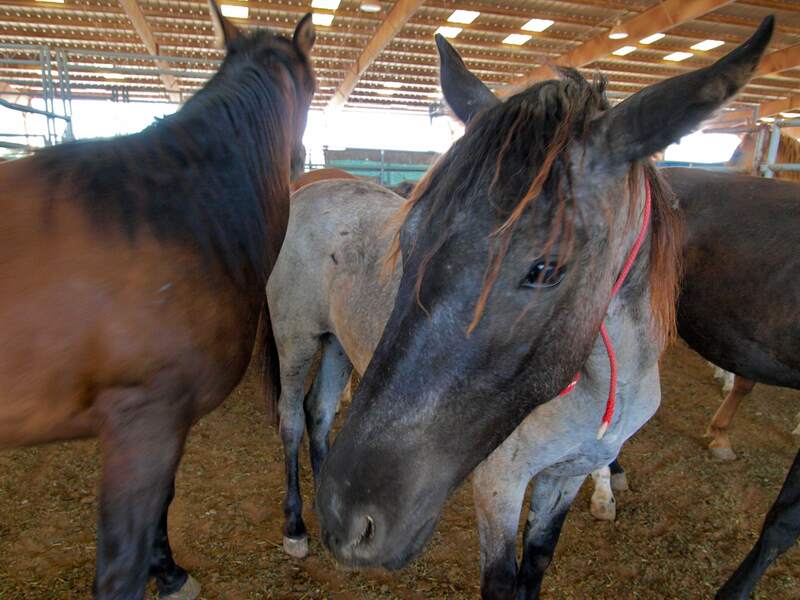 The $500 bonus is awarded a year later, when ownership for all animals is officially transferred from the BLM to the adopter. The year-long wait is intended in part to keep animals from being sold for slaughter. After a year, a vet must sign off on the health of the animal, then the adopter receives the title, after which they are free to sell the animal if they choose. During the first year, adopters may return unwanted horses to the BLM, but they are responsible for delivering the animal to the holding facilities in Oklahoma. 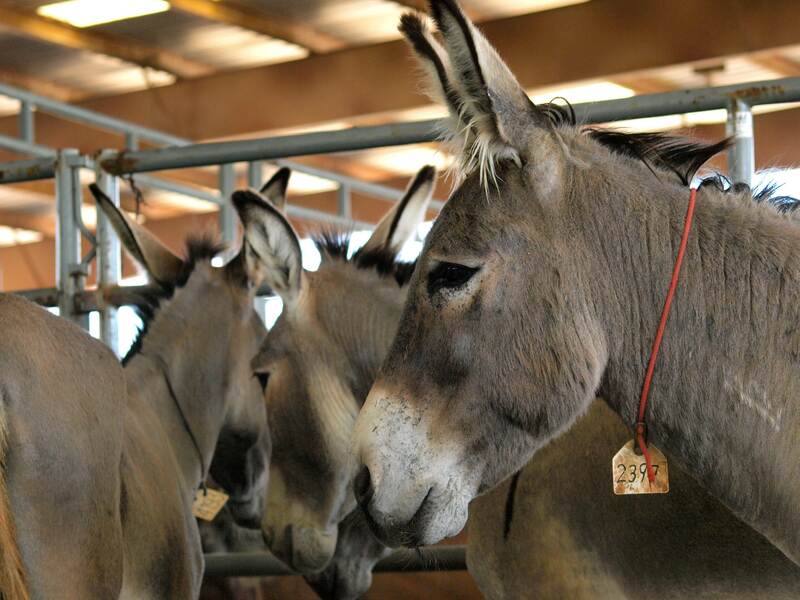 Today during the auction, 8 horses and 5 donkeys were adopted. For the rest of the day and the rest of the weekend, all the remaining horses are available for adoption on a first come first served basis. If you’re approved, you can have any horse in the pens for $125. If I had been feeling reckless, I would have taken this blue roan filly. Rounded up this past winter in Utah, she was skittish but curious and a natural ham. Charming and beautiful, I’m sure she’ll find a home this weekend. 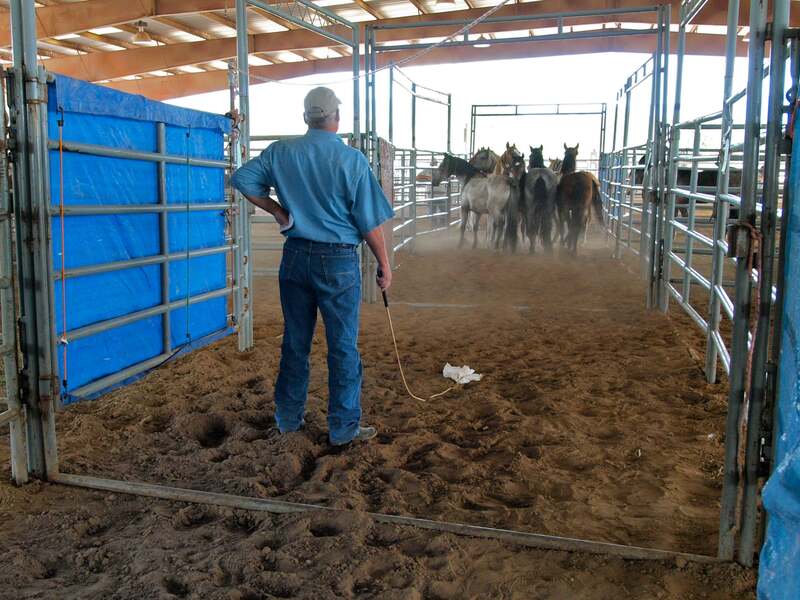 Most people serious about adopting a horse today brought trailers and after the bidding finished, the BLM staff went about separating the adopted horses and moving them through chutes and onto the trailers. Isolating the animals was harrowing to watch; as soon as a person entered the pen, all the horses panicked. Waving a whip with a flag on the end, the herder would try to move all the animals out of the pen into another larger holding area, leaving just the target behind. By opening and closing a series of gates the horse could then be moved through the increasingly narrow chutes. The last section of the chute consisted of a narrow wooden box the width of a horse where the animal could be briefly confined and haltered and then loaded directly onto the trailer. Bringing one of these animals home and learning to communicate with, trust and be trusted by a wild mustang must be among the most extraordinary of all equine adventures. I do wish these horses could have stayed wild on the range, but all of the animals adopted today seemed to be going to the best of homes. I asked several people what they were planning to do with their horses and every one of them said “love it”. One woman I congratulated for choosing a particularly lovely sorrel filly was so thrilled that she hugged me, tears in her eyes. When I was 12, I bid on and won a driving pony, complete with cart and harness, at an Amish auction. My little red mare “Saturday” and I spent the next ten years driving up all the back roads in my home town. Saturday died in my arms almost exactly a decade later, concluding the greatest childhood adventure anybody has ever had. I didn’t bid on a wild horse today, but someday, I will. Click here to see more photos from the auction and here for more information on the BLM’s Wild Horse and Burro adoption program. Auctions and adoption events take place multiple times a month all over the West and a few upcoming events are scheduled on the East Coast in places like Tennessee, Florida and Virginia. Animals are also available through internet adoptions. This entry was posted in Cowboys & Horses, New Mexico, Photography, Uncategorized and tagged adoption, BLM, donkey, mustang, wild burro, wild horse. Bookmark the permalink. Excellent writing and detail…heart-moving, too. I don’t have the means or the living situation to help in adopting any of the pretty horses, but I would love to. Thank you for your beautiful and exacting writing; it is such a pleasure to read. I adopted a wild mustang from the BLM. Got pretty banged up gentleing him but he turned out to be a dependable horse and I still have him.